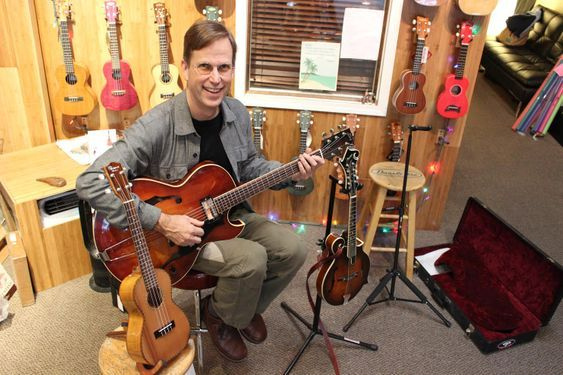 Todd Kimball has been playing guitar and mandolin for 31 years and is quite proficient in a variety of syles. He's played in theater groups, jazzquintets as well as big bands, blues bands, rock bands, country bands, and bluegrass bands. He studied jazz improvisation and arranging with Ray Brown at Cabrillo College and has studied with some of the bay areas finest jazz guitarists. He offers a wealth of knowlege in the areas of music theory, arranging for solo guitar, bluegrass mandolin, flatpicking, fingerpicking, jazz guitar, and rock and roll styles. Todd encourages all his students to learn to read music and caters the lessons to the students musical needs. He's a very "user friendly" teacher. I have been playing guitar for nearly 30 years, and performing for the past two decades. I've been exposed to many styles of music over the years. I'm an experienced rhythm and lead guitar player who has backed up many other musicians over the years in addition to fronting my own bands. I have played on various recordings for other artists and did all the guitar work on my own albums. I started playing guitar at 12 and my young adult life was filled with music and countless jam sessions with players at every level. I have given guitar lessons for many years as a private teacher and in school environments. In addition to private students, I currently teach for the StrikeAChord program at East Bay schools. I have been told that I have a special ability to create successful experiences for students. I have a great deal of experience breaking complex chords, advanced strumming patterns and lead playing into easily digestible pieces. My goal is to teach you as much as you want to learn, in the shortest amount of time. Acoustic music that covers alot of territory, Mike Ehlers moves from eco-folk-rap to pop, from alt-country to mellow grooves, from story-folk-with-a-punch to ballads born in the depths of a quieted gratitude. A multiple first-round winner of WCS (West Coast Songwriters) competitions in Northern California, he won "Song of the Year" in the Sebastopol division for 2010. Originally hailing from Northern California, Mike returned in 2009 after spending the five years in Canada, where he gained a faithful local following. Recent performances in Northern California include The Freight and Salvage in Berkeley, The Mystic Theatre in Petaluma, The Hopmonk in Sebastopol, The Union Room in San Francisco, Napa City Nights, Casparfest, and several appearances in the Mendocino Stories concert series. Past shows in Edmonton include City TV, several appearances on Radio CBC's Center Stage, the Jubilee Auditorium, 'Night of Artists', the 'Heart of the City Festival', 'Winterfest', the Arden Theatre, the Northern Lights Folk Club and a variety of other venues throughout Edmonton. Glad to be back in his native land, Mike continues to write, record and perform, touring Northern California and beyond.